Who else is secretly building? I can't wait for testing to begin. I was unable to locate suitable aluminum material off the shelf. I couldn't find any in the hardware stores around here so I went second hand shopping and now have two suitable pieces to start with. I'm going to have to build a Tesla Coil for this project. Any suggestions or thoughts on that are welcome. And to keep the two charged rotating discs from flipping polarities? You could probably find a former similar in size to what Alexey has. Suggest a PVC pipe of 2 to 3 inch diameter of a certain length. Normally winding sparking coils one uses about a 1:5 diameter to height ratio, but Alexey's looks like it's a tad taller than that... So you could go ahead and wind your secondary coil and also your primary coil. Which is often only about 4 to 6 turns. Alexey simply used a bit of clear elephants trunk hose and used the wire coil that runs inside it. Make a small jig (something to hold the pvc pipe while you can still turn it) and makes the task quite quick and easy. (Also good to clear coat the finished coil). I'm simply using one of my existing coils made for sparking, which is wound on a 3 inch pvc pipe. 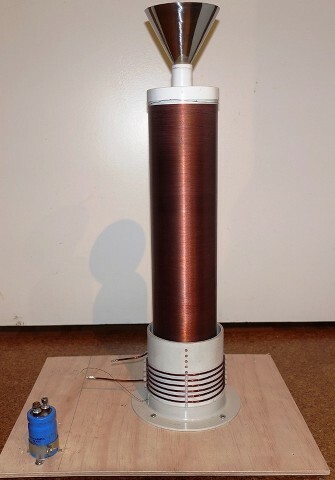 I've made a new primary coil and the picture below shows it complete. (I'll remove the shiny cone and replace with a connecting wire). From what I can see, it needs to have some feed-back from the coil to setup a constant resonance, either by some kind of Slayer exciter circuit (the neutral (base) output of the secondary coil triggers the base of the transistor) or from a separate feedback coil wound near the primary coil which provides feedback. So it needs that function. (I wouldn't normally say that btw). The other important feature is that I believe it needs an adjustable duty. This is what Alexey adjusts so that for a given frequency or CPS, the on-time of the transistor can be set so that is it a very narrow pulse that drives the primary. This sharpness of the pulse maybe critical for the tuning process? So this is what I'm looking at doing next. The driver circuit for the Tesla coil, that has positive feedback to keep resonance and also a duty adjustment. So when I find the right circuit, build it and get it working, I'll post exactly what I've done. A pre-built driver with these features would be the easiest thing to use. The one spacecase posted would work fine, but it may not have an adjustable duty cycle feature. I hope there are others secretly building too.. (But then it would no longer be a secret if they say so). I have some time off next week so things should progress hopefully. Last edited by Sputins; 10-04-2018 at 01:32 PM. you are making the induced electric field energy. you do need to tune it to make that the most efficient. from tesla's notes, you want to feed a pulse that is (when converted to a wavelength) is 1/4 the of the secondary coil resonance wavelength. and assumed here that you also designed your coil so that is near the secondary coil wire length. Thankyou for the help Sputin's, Spacecase0, Ufopolitics, Nutzvolts, ect: I'm going to need a lot of help with the electrical part of this thing. I'm hoping Sputin's rig or someone elses will be the machine that gives all of us a successful replication. A lot of ideas to experiment with if we can get one levitating. I'm reposting this here. Sinergicus posted this in the ARV tread. If you haven't listened to this interview before then I highly recommend it. Total length is 46:00 minutes. Specifically skip to about the 37:30 mark in the interview and listen to what James E. Cox has to say on one theory of gravity: Tesla's and then his own take on that which I transcribed below. Sounds to me like a precise description of what is taking place with the Alexey Machine. "37:50: Kind of like a dielectro Coriolis force ~ a dielectrical Coriolis force ~ if you put a dielectric material in a non~uniform electric field it will be attracted towards the region of higher intensity; and so it's tempting to think that gravity could be nothing more than a dielectro~Coriolis Force in a non~uniform alternating electric field." I don't know folks but I think Cox just described the Alexey Chekurkov flying disc machine to a Tesla point. Last edited by Gambeir; 10-05-2018 at 01:23 AM. Anybody feel free to correct me:A Kacher is similar to Slayer circuit, basically a solid state Tesla coil where feedback from L2 drives the base of a PNP or NPN transistor, which sources or sinks L1. The advantage of the Kacher/slayer SSTC is that resonance self adjusts so an idiot can build it and make it work. A true "Tesla coil"(because he had many variations) usually associated with lighting discharges, uses rotary or magnetically quenched spark gaps driving tuned LC tank circuits for L1, and L2 has to be tuned to L1 and loosely coupled but not directly connected to each other. To function, the design parameters have to be well thought through. Whereas Slayer's are easy and cheap to build. Again, I must point out Alexey's note about the difficulty tuning the system. So without some sort of system goal, separate functioning sub systems may be put together without success. Anybody feel free to correct me:A Kacher is similar to Slayer circuit, basically a solid state Tesla coil where feedback from L2 drives the base of a PNP or NPN transistor, which sources or sinks L1. The advantage of the Kacher/slayer SSTC is that resonance self adjusts so an idiot can build it and make it work. A true "Tesla coil"(because he had many variations) usually associated with lighting discharges, uses rotary or magnetically quenched spark gaps driving tuned LC tank circuits for L1, and L2 has to be tuned to L1 and loosely coupled but not directly connected to each other. To function, the design parameters have to be well thought through. Whereas Slayer's are easy and cheap to build. Not to say you're wrong or anything like it but I have complete faith in your talents and skills as well as those of many others here. If Alexey can do it I know you people here can do it too. Once we have a little more time we will have a clearer idea what is happening. I think we have a much better idea how this works than when I started the ARV thread. I'm pretty tired and have to stop but I think James Cox comes closest to broadly covering two of the parts involved in how the machine works, but there are clearly others and we have talked about these before: Jerry Bayles paper on atomic vectored force is another, and of course Stienmetz and Wheeler's ideas which are supported by Joe Parr's work. My point is that it isn't resonance alone, it's a combination of things, and what seems to be a matter of tuning frequencies is more likely to involve a more complete understanding of all the factors which need to be working together to make the machine work. It's just like any other machine in that all it takes is for one thing to not be working correctly for the entire machine to stop working. Last edited by Gambeir; 10-05-2018 at 03:09 PM. all the spark gap and tuning to get a tesla coil to do what it should is the old way to do it, and if that is all you have, then it does work. I would drive the primary direct with transistors that is driven by an arbitrary wave form generator. you can easily set any detail you want that way. but Alexey does not show a spark gap, so it is likely just a sine wave with nothing special going on at all. First, we have the idea that the device is a kind of asymmetrical capacitor. Call this the Quartz balloon theory. In it the HF AC is feeding charges to the DC plates while opposing a flipping polarity in the DC plates. A possible association to this idea is that the magnets are creating a vortex to counterspace and grounding out; leading to a direct asymmetrical capacitor or a kind of electric balloon. These ideas don't really describe what is happening. Second, we have a gravitational theory which is based around the the paper of Jerry Bayles and the thoughts of James Cox. This is the atomic vectored centrifugal force model of Bayles combined with James Cox's idea that this vectored force has to include an AC current operating inside of a non-uniform electrical field, and while being exposed to a Coriolis force. The question is why is this complexity necessary? Notice that in the Otis Carr OXC-X1 the same vectored centrifugal force concept is employed in a macro scale electro-mechanical system. This is fundamentally the same concept as an atomic vectored centrifugal force, and while operating under a Coriolis Force which is simulated with gyroscopic precession. An electrical circuit every half cycle of rotation in the rotor system induces a flipping of the gyro system creating a vectored centrifugal force. This is all controllable through the multiple electrical contacts. Once you understand this idea then the OXC-X1 is revealed as a electro-mechanical gravitational flying saucer. The Alexey is a gravitation system described by using a Bayles/Cox combination. That explanation describes a true atomic level gravitation system. A true gravitational system is one more complex than we probably understand at this time. It undoubtedly includes all of the above and more, and because there is a complexity in operation, not all of which is known, acknowledged, and some of which is even denied, and so the tuning of the Alexey machine is supposedly problematic and there is a need to understand what factors influence the machine that we already know about. On one hand this makes sense. On the the other it makes no sense at all. If for example, gravity were so complex and require such tuning than how in God's green earth doth the planets and star's remain in the heaven's? So you see it isn't even logical in that sense. Logic would seem to say that there has to be a huge variable if frequency alone were the issue: Therefore this has to involve more. More is all of the above and then some. The evidence we do have says that those rumored systems of highly advanced machines, like the Black Triangles for example, are creating a Super High Frequency and they are doing that also by operating an AC Current in a non-uniform electrical field. This non-uniform electrical field doesn't seem to be the same as the one which is being artificially created by the DC plates in the Alexey Machine. Instead the non-uniform electrical field is surrounding space itself, and for those systems to work the frequency of the AC current has to be much closer to the frequency of the non-uniform electrical field around it, which is the counterspace itself and which is billions and billions of times faster than the speed of light. So now here is my conjecture; the ideas are similar but the Alexey is creating it's own local counterspace with the DC fields acting in conjunction with the rotating magnetic field and thereby it creates it's own local non-uniform electrical field: Effectively replacing counterspace in the immediate local space. Now if this is correct then there is a correlation between the DC and AC which has to be working together to create the same effects as the OTC-X1 (vectored centrifugal force) but since this is an electrical system there is a specific band length or region where the two electrical fields will work together to create this flipping in the gyroscopic spins of at an atomic level and at the right time, like say every half cycle at the atomic spin level: Understand? This flipping action takes place in the AC field. That's the field which is moving back and forth through a magnetic DC flow: The magnetic DC is the Coriolis force which induces this flip that creates the vectored centrifugal force at the atomic level: Understand? That's why the frequency of the AC has to match the DC created counterspace. So the magnets spin and the DC together determine what the AC cycle has to be for this vectored centrifugal reaction to take place. So the DC Magnetic Field is a Coriolis force field. This tells us then that counterspace is akin to this same energy field, only that field is moving at vastly higher speeds, so fast that the effects are instantaneous. This explains the near vanishing act of the Black Triangle I observed since the closer that machines frequency is to the surrounding space the greater capability it's speeds are. Now is that making sense to everyone now? Notice that your own surrounding space is a non-uniform electrical field. Lastly, if a local gravitational effect is the product of the Alexey machine, and I believe this is the case, then it is most probable that the machine would benefit from more mass and not less. This is precisely in line with what Mark McCandlish has said about the ARV, that the bigger and heavier they are the faster they can go, and this makes a great deal of sense if you have a mass creating it's own gravity field. I think more mass in the AC plate might be needed and might alone explain the evident difficulties. PS: So frequency between the electrical systems and the materials in use are all significant because the Alexey, like the Nazi Flying Saucers which went before, artificially create a local counter space to operate in: The prosecution now rests its' case. Last edited by Gambeir; 10-06-2018 at 11:15 PM. The Nazi Saucers, the ARV, and the Alexey are all similar. The Black Triangles work off the understanding of how the previous generations operated, but are an entirely new and more advanced machine, and which do not alter the surrounding space as the predecessors do, but rather interact directly with the same space/counterspace that you and I do and this is a huge difference. The surrounding space contains counter space which is an incoherent energy field that I've mistakenly called the dielectric field. Ufopolitics has tried to enlighten me but this has proved difficult. Nevertheless there it is; counter space sitting right next to you, and that space is what James Cox called a non-uniform electrical field. Cox is talking about counter space and he also included the all important idea that this non-uniform field is moving, that it is influencing the AC field with a rotating magnetic field which he then called a Coriolis force. It's quite clear that James Cox is completely aware of how atomic vectored centrifugal force creates gravity and that's why he said what he did. Now hopefully this is somewhat clear enough to grasp how you then get back Otis Carr and the OCX-X1 because that's where all this spinning, twisting, and electrical shocks come home to roost in a more visible and physical form that end up creating a vectored centrifugal force that Jerry Bayles wrote about. So all this spinning, twisting, gyrating, is what is taking place at the atomic level resulting in the stuff we have naively called gravity. Well it is gravity except it's just that we have all been lead to believe dirt is born with it. The Alexey machine has a rotating magnetic plate that's conducting an electrically charged magnetic circuit in a DC field through an AC field, and because it is AC that field is moving back and forth, and the DC field is also rotating as it moves being carried along by the magnetic plates spin. Again observe the Otis Carr OTC-X1 to gain some basic ideas about what takes place at an atomic level. Clearly Carr understood this idea. Also notice that the ARV has sectioned plates set in layers. It's working essentially the same way as the Alexey but with an entirely electromagnetic plate rotation process conducted through a pie plate pattern that's fired off sequentially; one after another as it were. These machines are creating a sort of bubble to operate inside of, and which does change the relative relationship of energy, and because (as explained by John St. Clair) the effect of these interactions results in change in the relative speed of light inside that self created bubble. The result of which happens to be blurry images in photographs for one thing. Levitation and FTL Super Luminal travel being another. I want to point out here that it's important to not run ruff shod over this. Burred images in photographs prove what? That the immediate surrounding speed of light isn't the same as it is for everything else around in the same photograph. This is evidence strongly supportive of the idea that the speed of light has been manipulated by this process. Now it actually makes sense if the upper and lower DC plates are moving together but maybe the upper plate doesn't even have to rotate. Maybe it could just be a floor like the crew compartment in the ARV since the magnetic field is actually creating a magnetic field across the space between the two plates, and maybe that field simply follows along without any assist same as attaching a block of steel or iron to any other magnet. It just assumes the magnetic. The ARV's crew compartment isn't providing the upper plate because it isn't necessary. More likely the base of the machine itself would serve that purpose or it has a triple plate system with the DC plates covering an AC between them. As Bayles states, the magnetic field also moves/projects very slowly, and then W. J. Hooper says they can detect an unknown slowly moving field with his device. John St. Clair say's in his patents that his creations are altering the speed of light in a local environment. Obviously he has to explain this in Einsteinian terminology or the patents would never have been granted. Alexey's machine is creating a change in the local environment by changing the velocity of counter space which acts on all of us, and which we think is gravity, and it does that by making a kind of electromagnetic bubble about itself where the speed of this counter space is now controllable. It is a gravitational machine but it's an artificial gravity machine and as soon as the artificial space it's created collapses the machine drops back to earth. Nevertheless, that collapse isn't immediate, which seems mysterious but that's why this machine sits there without power until the field it's created collapses. Last edited by Gambeir; 10-06-2018 at 10:51 PM. Now the part I've left out are the ultrasonic emitters, light, plasma, and how this then may be involved. I say may be but I have a sense that there is a bridging which takes place between this artificial altered space around the machine and how that space then links itself to the greater immediate space where we ourselves are now living inside of. So I think that one or more of those items has a probable necessary and maybe vital part to play. Time will tell I imagine. Right now though, I am convinced that this machine works because everything I know say's this is why it works and which I've attempted to sketch out with words. Last edited by Gambeir; 10-06-2018 at 10:53 PM. First of, id like to ask, is this particular device in line with Thomas townsend brown devices? I've gone a quick reading on the 3 pages and had an impression that you guys are building asymmetrical caps and charge them with high voltage? (excluding everything but electrical). If so, have you guys had any success?.. I'm entirely new to this study and have had experienced in my previously experiments with high voltage flying wires forcefully making connections to my antenna that was around 30kv-50kv not knowing why that happens I just disregard the effect and move on as iT was not my goal at that time, now Im not entirely sure if this is the effect same with what you guys are trying to achieve. Anyway it wouldn't really go bad mentioning that. This is all research. It looks like that at a glance Ricards, and that was one of my own first conjectures, but no that's not what is happening in the machine. That's way too simple. BTW, Sputins is leading in the replication effort right now. In my opinion, the machine is creating a gravitational field and it does this by first creating an artificial environment, or surrounding space, and then uses standard electrical theory and physics to produce a vectored centrifugal force. This vectored centrifugal force is produced by acting upon the spin states of matter at the atomic level. It's not as complex as it sounds. Its just not something most people are very familiar with. A little time is needed before stuff clicks and makes sense. In other words, vectored centrifugal force is an explanation for gravity and which is something that happens at an atomic level and all the rest of the things happening in this machine have to do with how to create the artificial enclosing space and then how to replicate a propelling vectored centrifugal force at an atomic level. Once you get this idea down then it's on to understanding other matters. Hope that doesn't sound offensive. It's taken a long time to arrive at what I think is happening. Last edited by Gambeir; 10-07-2018 at 12:34 AM. I'd suggest start by looking over at this machine designed by Otis Carr. The reason you want to look at this is to see what takes place at the atomic level. This way you have an idea what creates a vectored centrifugal force at the atomic level. You don't have go deep. You just need to see the machine as a macro scale atom with it's field of spinning electrons, because that's the model I'm sure Otis used and which makes complete sense. The key to understanding the machine is that the so-called Ultrons (gyro's) are made to abruptly alter their spin which produces a centrifugal force. How they do that, all the other complexities of what's involved in making it happen, how to direct the energy and so forth are all helpful. I've not studied it in detail myself either having not previously comprehended what made it tick, and so like many others it looked like some contraption which I've seen contrived by others, but I did know some of the history behind the machine and I have listened to Ralph Ring so I know this machine has some very solid work behind it. Now the Otis Carr OCX-X1 is basically an analog centrifugal force inertial drive system which is modeled on atomic spin state gravitational theory. It is an all mechanical system for the most part. It is designed to act in the local environment just like an airplane, or car, or the space shuttle and it is designed to mimic the same sort of propulsion force as described by Jerry Bayles paper on vectored atomic centrifugal force. The Alexey is a combination analog and solid state gravitation machine. It's different because (I think) it is altering an area of space around the machine and this is unlike the OCX-X1. It is still using the same general idea described by Jerry Bayles to produce a motive force or gravity field, but how it does this is not direct as it is with the Otis Carr OCX-X1. The Alexey is making/creating an artificial environment for itself in the same air space we are in, but which is significantly different. It is, in effect, creating an area of altered space time which then significantly changes what the machine is capable of doing and may be doing: At least according to Einsteinian Physics. I'm saying this partly because of the known effects of so called UFO's, which include lost time, slowed time, teleportation and others as predicted by alterations in space time, but space is not what Einstein thought. Rather space is what Tesla thought, but it is still a space which can be monkeyed with, and essentially this is what I think the Alexey machine does do. I think this for a number of reasons. I'm not positive of it but I suspect it is creating an kind of artificial space around itself. To understand Tesla's idea of what space really is you should read Stevens on the Aether Theory. Only a page or so. The reason you need to read Steven's explanation is so that you can then understand that the Alexey probably cannot create a frequency high enough to interact directly with space time, or our own natural space, and so it creates an artificial space of it's own, or a bubble if you will that allows it operate as a kind of proxy to a higher frequency gravity inducing energy field. This bubble of altered reality is most probably the cause of the associated anomalies encountered around UFO's. We can be pretty sure this is likely as machines such as the Black Triangles are using a fully digital sort of gravity creation process that creates a super high frequency which allows for a direct connection to the same energy field which creates gravity as we know it. My reference of aether theory would be aethro-kinematics by steven rado this is more of a mechanic conception approach to understanding aether, and am into paul leviolette work at the moment, I Do keep an open mind though, and gone through the links you gave, didn't understand much so i probably need to read again. I figured out how to tell someone what is going on that most everyone will understand. but then they convert it to words they use. I am not sure the disconnect is going to get fixed anytime soon. Well it's not like I'm someone who can claim to have any real knowledge, and I don't know it it's really all that important to have a precise understanding right now, probably the reverse. The last thing we need more of is petrified opinion which has no real support to uphold it. The important part is that there is an unknown energy, it does things like form gravity and we have some ideas about how this unknown energy might be involved in doing that, and we know that the the physics we do have don't work to replicate this. Meaning no physics I know of can explain the Alexey with the energy input that it is receiving and therefore it has to be having an affair with the unknown. The only thing that can explain it is probably something similar to what I've attempted, and to say that there is a connection to counter space is more accurate and we can assume this to a certain extent because of the magnets. Now of course I have the advantage in having actually seen a black triangle and saw what it was capable of, and that machine is operating on a different set of laws of nature than the ones our official physics are using and so they cannot explain how it works without resorting to fantastical ideas about energy needs and so on but it is still related to the Alexey. For one thing, there is no way in God's green earth that machine, the black triangles, are using any form of propulsion which is officially acknowledged, let alone even considered. We are talking about a vehicle that can be on Mars within minutes in seconds. The only way I know of that could explain its abilities are linked to ideas about counter space and Aether, and it's really the work of a number of people which leads me to the conclusion that the Aether is an energy field; that it is counter space and that it is like a superfluid moving at billions of times the speed of light, and just as Ken Wheeler has said, this energy field is what creates gravity and it does that because it is an incoherent energy field. Now of course don't think for one second that the machine doesn't have an alternative explanation concocted by the Einsteinian Crew. The black triangle they will claim is losing mass through the Woodward effect, and then they will proceed to prove that math to the satisfaction of most gullible people. Never will they tell you, even if they suspect it, that whatever the real physics and explanation, there is still another energy field which this machine is linked to and which enables it to cross the galaxy; in 30 minutes or less as the saying goes. Now of course there is no intent to release now, or ever, the understanding of aetherial counter space as being a medium or energy field which moving billions of times the speed of light. Woodward came close to understanding this energy field with his ideas and they are at root to why these machines work. Now of course any machine which does link to this energy field is going to behave differently, it is going to lose mass since mass is a function of gravity. So ya know there's going to be a lot of Bull flying around from the Einstein Club for a long time. Some justified and a bunch that isn't. Whatever you hold as an idea about the Aether is good enough for me.I wouldn't worry about matching ideas about the nature of an energy which we can barely conceptualize and which is officially denied. Better probably that you go your own way. Josiah Thompson, a noted investigator whose investigated hundreds of crimes and who wrote "Six Seconds In Dallas" said that in all investigations there comes a time when the facts and evidences coalesce and come together, and when they don't is when there is an active determination to make that not happen. We have passed down many avenues to arrive here and we are here because we have a piece of physical evidence demonstrating what should not be possible. So whatever we end up with will be a direct line linking Alexey's machine to the most advanced machines; the same as any other piece of technology which must operate in a specific environment. A model airplane flew long before any other and it is certainly neither as advanced nor as complex as any other form of human carrying machine, but it is nevertheless still an airplane working off the same principles and so the Alexey is a model flying saucer and it is as simple as that. Now we just have figure out how it's doing what it's doing. Last edited by Gambeir; 10-07-2018 at 12:41 PM. Last edited by sinergicus; 10-07-2018 at 02:45 PM. one issue happening here is that there are likely a few ways to get past gravity. or you can just make yourself move the opposite direction from gravity. the device in this thread likely does some of each. you can use the electrostatic lifter. They work, but not very efficiently. the other lost bit of information is that there are 2 things we see as voltage, one is electrostatic, and the other is induced by a moving magnetic field (like in a generator). They are not the same, but each does show up as voltage. so, the trick to move is to set up the same asymmetrical field shape that they electrostatic lifter has, but do it with a moving magnetic field. this leaves you building something very close to Alexey Chekurkov’s Flying Discs. only change would be that you want the top disk smaller and the bottom disk larger. and you likely would not need the electrostatic DC or AC voltage or the ultrasonic. it is very possible that the electrostatic voltages they way he has them changes the field from the equal disk size to being asymmetrical as needed. The sun no more "HAS" a field than does a magnet have a field. Nor does the sun "emit" light, Light is a field perturbation. a person in a pond flapping their arms doesnt EMIT anything either, its a field (in this case water) perturbation. the Field around a magnet or the sun is the mediated pressure modalities of the Ether itself. Second, spacecase0 brings up the valid important understanding for recognizing fundamental differences between the quote: "2 things we see as voltage, one is electrostatic, and the other is induced by a moving magnetic field." Thirdly, aljhoa correctly directs our attention to super-fluidity and the statement by TheoriaApophasis (Ken Wheeler). Which like all of Ken's stuff is filled with humor. Quantum science seems to be a misunderstanding of the energy field which Ken is talking about. Our own Star is standing in a pond flapping its arms. Light and energies associated by that flapping are the result of perturbations to the energy field our Star is standing in and nothing more. This substance, which has been called the Aether and counterspace, is a Super Luminal energy field which is billions and billions of times faster than light, it exhibits a Super-fluid capability and penetrates all matter without resistance for the greater part. For the most part, only the matter it passes through does itself react to the passing of this energy field, and only those parts of matter which react to the field create a perturbation in that energy field. Light is a product of this energy field passing through the Star. Gravity is a product of this energy passing through matter. Quantum science is a misunderstanding of this energy field. Particles don't exist, they don't pop in to and out of existence, rather what has been mistaken for particles are snapshots, glimpses of this energy field passing at the fantastical speeds it does through our own matter, and we are evidently gathering this idea that "stuff" is created by our thoughts out of a quantum field of energies and so if we can figure it out we can think in to existence anything, but there are no particles popping in and out of reality as some think there are. There is only this other realm which is creating the reactive forces that give life, gravity, and light to humanity. This all reminds me of Einstein's ideas which have now so screwed natural logic that the most absurd ideas are thought possible or even real. It's no wonder Telsa called him an idiot. Let me give an example. Suppose you wanted or needed to get from say Seattle to Tokyo in 5 minutes or less. Now which would do; would you go about trying to create a worm hole or would you instead build a machine that could do the job? My guess is you'd do the most practical, which is to build the machine to do the job, and this illustrates how sickeningly mind controlled we all are. I know, I'm not any different from anyone else in this area. Now what do we have for evidence which supports the two? We have evidence for machines is what we have. Not worm holes but machines which can now cross the galaxy. Space is nothingness as Tesla said it was. Nothingness doesn't cause the Star to glow. Energy passing though nothingness interacting with matter does. I repeat; this energy is moving at fantastical speeds: It seems to be a fluid because of this, it seems to be a solid because of this, it's been mistaken for both. Isn't it a wonder why a Tetrahedron shaped Star Destoryer is featured in Star Wars going and coming out of hyper-space? What is hyper space then if not counter space? Don't ya see now that jumping to hyperspace means jumping on to the counter spacial energy field. This is where the technology behind the Black Triangles is designed lead and to latch on to, it's designed to create Super High Frequencies, and to then broadcast that frequency to the matter which makes up the Star Ship and so that the entire outer hull does itself vibrate in the same frequency band of counter space. Now there's no way we are remotely close to what is possible even with these ships, but compared to my 1941 dodge pick up it's a big step up and outwards. If space is nothingness then counter space is everything which makes nothingness react as if it was not dead matter which includes us. This would seem to suggest that seemingly wacky ideas like flying levitating humans are not beyond the realm of sane thinking. Last edited by Gambeir; 10-07-2018 at 09:56 PM. I suggest we move this discussion over to the ARV thread to keep this clear for replication information and experimental reports. These lengthy posts are defeating the purpose of this thread is the reason why I think we need to move my banter which seems dominate. Agree or do you think this is fine? Last edited by Gambeir; 10-07-2018 at 10:51 PM. Did somebody know what rotation speed Alexei are using at his disks ? ?Thousands or tens of thousands rpm??? Now please transfer all your very interesting -but looong... -posts to ARV Thread...then delete this one's here. We all have/ need a LOT of open questions, answered/solved which are purely technical and ONLY RELATED to ALEXEY'S DEVICE. @Sinergicus: I believe those 2 discs are not passing the 1000 RPM'S. Last edited by Ufopolitics; 10-09-2018 at 02:14 AM.